At the moment when I have time to do some baking I want to make sure my recipe is quick and easy and something that I know will work. I would be really sad if I spent the time trying a new recipe out only for it not to work! This recipe isn’t one I have ever done before but it used the basic principles of 3,2,1 shortbread biscuits but with a little bit of a twist. I looked in the cupboard to see what I had thought I would try making wholemeal biscuits instead and since I had some chocolate icing I wanted to use up, I had an idea how I might put these together. You could do any shape you wanted but as I wanted small cookies I only had this shape cutter. In a bowl cream together the margarine and sugar then stir in the flour. When the mix begins to look like breadcrumbs, turn it out onto the side and use your hands to press it together into a dough. Try not to mix it too much at this stage – you just need it to come together. Cut out an equal number of your shapes. I managed 24 using my cutter, enough for 12 biscuits. Line them on greaseproof paper and bake in the oven till the edges brown slighty. This may take between 10-15 minutes depending on the size and thickness of the shapes. 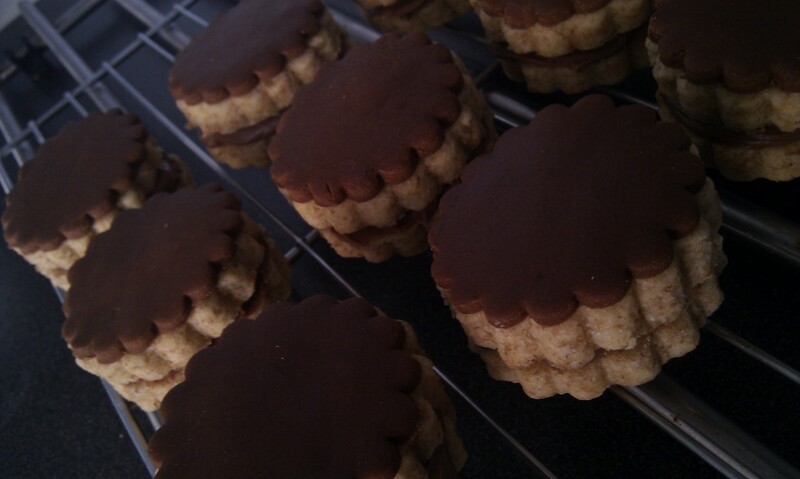 Let them cool on a wire rack and using the same cutter, cut enough shapes needed out of the chocolate icing. Put the chocolate icing onto half of the cookies whilst they are still hot – this causes the icing to stick to the biscuits without having to ‘glue’ them with jam. Once they have cooled you can begin assembly. Take two cookies, 1 with icing and 1 without and sandwich them together with chocolate spread in the middle. For Christmas this year we were given a bottle of Caffe Moka Varnelli by my Auntie and Uncle, which is a delicious chocolate coffee liqueur. Now, you probably haven’t heard of this or seen it in the shops as it isn’t something you can’t buy easily in the UK – it is Italian, and from the Marche region to be precise. The Marche region is very special to our family as it is where my Italian side of the family come from and every year we go for our holiday there to the same little town, where we spend time with my Great Aunties, get some sun and eat… lots. After tasting the liqueur last Christmas I knew that I really wanted to do some baking with it. I originally decided on making a coffee cake and replacing the usual coffee with the Varnelli but after my mom looked through one of my recipe books she asked if I fancied making some ‘melting moments’ which are also sometimes called ‘Viennese Whirls’. The recipe I have created is on the same lines as melting moment biscuit as it is very crumbly and melts in the mouth but I have made a few changes to the recipe to make it have a rich chocolate taste and a Caffe Moka buttercream filling instead of the recipe lemon. The other big change that I have made is to change their appearance, though this has been through necessity and not through preference. Usually these have a lovely swirl piped pattern to them, however, my biscuits were made by rolling a small amount of the mixture into a ball and then flattening onto the tray with my fingers. I would have loved to have had beautiful piped swirls but I don’t have the right nozzle for my piping bag so it is a bit of a made do change. 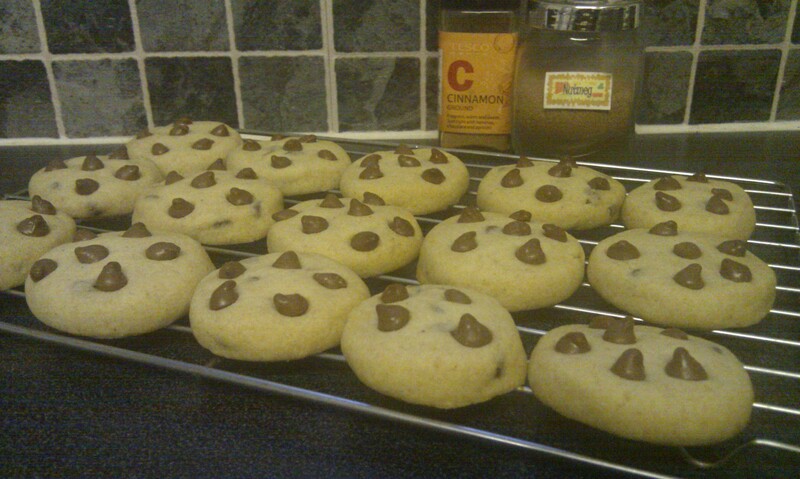 I also changed the name as they now resemble Italian biscuits called Baci, which means kisses. Mix together the butter or margarine together with the sugar until pale then stir in both flours, coco powder and Varnelli. Either pipe the mixture onto a non-stick baking sheet using a wide star nozzle or measure out teaspoon amounts of the mix and roll in your hands till ball shaped, then flatten with your fingers. This method can be a bit messy and sticky but instead of adding flour, just roll quickly. If it is too sticky then chill in the fridge first. Bake in the oven set to Gas Mark 5, approx 190c for about 12-17 minutes. The time will depend on how big or small your cookies are. 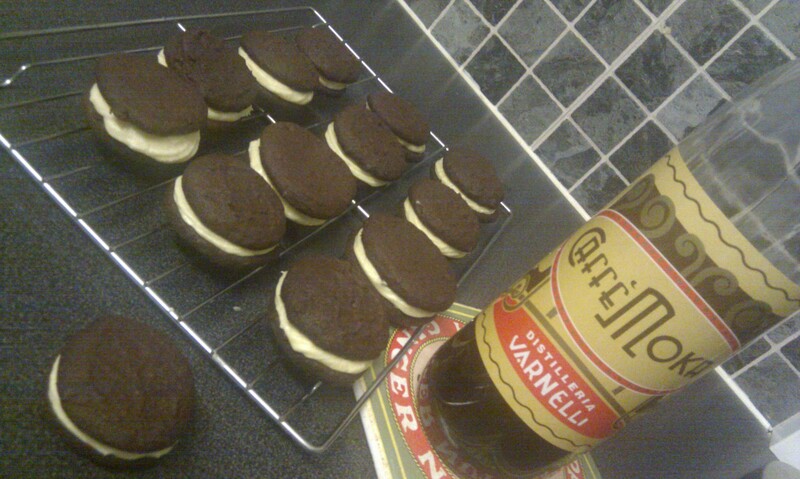 To work out if they are done they should be soft if pressed gently but with a little bounce in them. They will set more as they cool on the rack. Whilst cooling, mix the buttercream. To do this combine all of the icing ingredients and beat in a bowl till lovely and fluffy. Pipe the buttercream into swirls on one of the cookies then sandwich with a second one. Finally, make a cuppa tea or coffee and enjoy your biscuits. They will be extremely crumbly so handle with care.